The health and well being of our guests is paramount. ​​Our guests are fed according to their individual requirements and the wishes of their owners. Litter trays, food and water bowls are serviced regularly throughout the day. Details of dietary preference and performance along with any requisite medical administration is recorded and displayed outside each suite, enabling us to monitor and record each guest’s health and wellbeing on a daily basis. ​Please advise us at the time of booking of any medical conditions our guest may have. Where possible, we will be happy to administer any prescribed medication during their stay with us. We strongly recommend guests with chronic conditions that require multiple injections during a daily cycle (eg. diabetes), seek accomodation at a premises co-located with a veterinary practice. We provide our guests with a choice of Felix As Good As It Looks and Whiskas pouches, along with a variety of biscuits to enjoy between meals. Customers are welcome to bring their own choice of food if preferred, which we are happy to serve as an alternative to our stock supply. Please feel free to discuss at the time of booking. Guests are welcome to bring their own choice of food as an alternative to our standard menu. When kittens are born they are usually protected from infections by their mother’s milk, providing she has been regularly vaccinated. However, this protection only lasts a few weeks so they need regular vaccinations from an early age. Ideally kittens should should be vaccinated at 9 and 12 weeks, with an initial course of 2 injections and given a booster 12 months after their first vaccination. 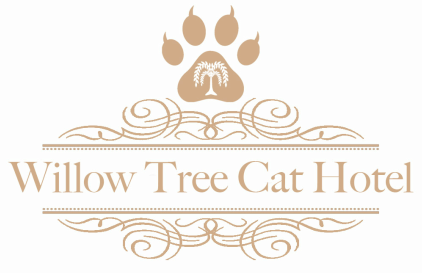 Willow Tree Cat Hotel takes great pride in the happiness, health and well being of it's residents. For all guests checking in to the Hotel, a current vaccination certificate that remains valid for their period of stay, must be produced on arrival. without production of an up to date vaccination certificate that remains valid for their period of stay at the hotel. ​In the unlikely event one of our guests became unwell during their stay, a suite capable of being securely isolated from the rest of the hotel's facilities can be utilised. The suite itself comprises a large fully insulated and centrally heated bedroom with a light, spacious exercise area overlooking the central garden courtyard. This suite is located directly next to the reception area, with access restricted and controlled via two lockable double glazed uPVC door units which enable constant monitoring of the guest's condition. If a guest becomes unwell during their stay with us, we will always contact their own veterinary practice where details have been provided. ​If this is not possible, our appointed vet at Green Hollows Veterinary Surgery in Ruyton XI Towns will be contacted in order to supply any immediate medical attention that may be required. On advice post diagnosis by the attending vet and where possible after consultation with the owners, if it is deemed necessary this suite can be utilised for the remainder of the guests stay with us at the hotel.